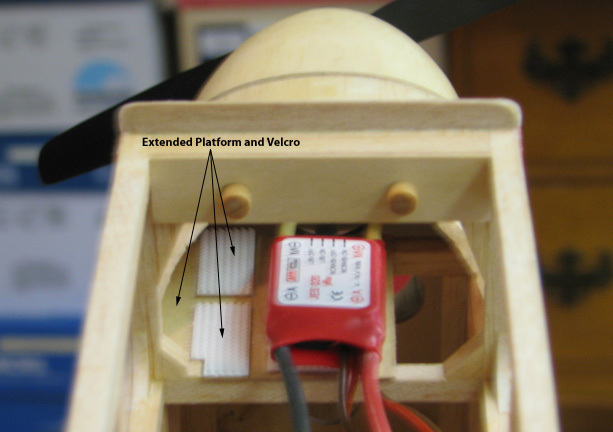 The picture below shows the Walston Transmitter inside the earlier lipstick tube. The problem was there was no quick or convenient way to hold the tube in its position and so it kept backing out during flight and falling down in the bottom of the fuselage. I really wanted a design that was simple, functional, and easy to work with. The transmitter batteries have to be removed and installed and the transmitter itself has to be transferrred from aircraft to aircraft. 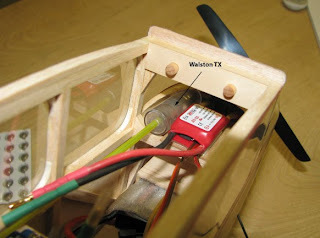 The design would have to involve some very small rubber bands that go around the tiny transmitter to hold it in place. So I went to the orthodonist and got a package of his dental bands shown below that are used on kid's braces to straighten their teeth. These bands are quite small, very durable, and extremely elastic. The design for the transmitter holder that I came up with is shown below. It consists of a 1/16" X 1/2" bass wood base with a short piece of 3/16" X 1/4" spruce drilled out for the antenna sheath and glued across the end of the base as shown below. This was cleard doped three times and two pieces of loop Velcro stuck to the bottom for securing the holder inside the Cloudster's cockpit. The antenna sheath was also CA'd in place. The transmitter's antenna was instered into the sheath and the transmitter was secured to the holder's base with four dental bands. What could be simpler or more functional and it does protect the antenna joint at the end of the transmitter. 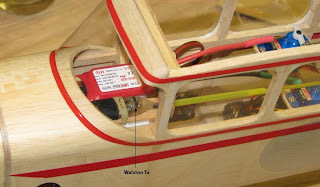 A piece of 1/32" plywood was cut out to fit down on the fuselage's cross members to the left side of the speed control's platform. It was clear doped three times and two pieces of hook Velcro stuck to the top for securing the transmitter holder as shown below.